Note of July 2, 2014: A reader theorizes that two pages were signed by a Samuel, who wrote his name backwards. Samuel, who didn't give his surname, might have been an important person in Mary's life - a brother or husband - in case that is a clue as to which Mary Tracy was the owner of this album. 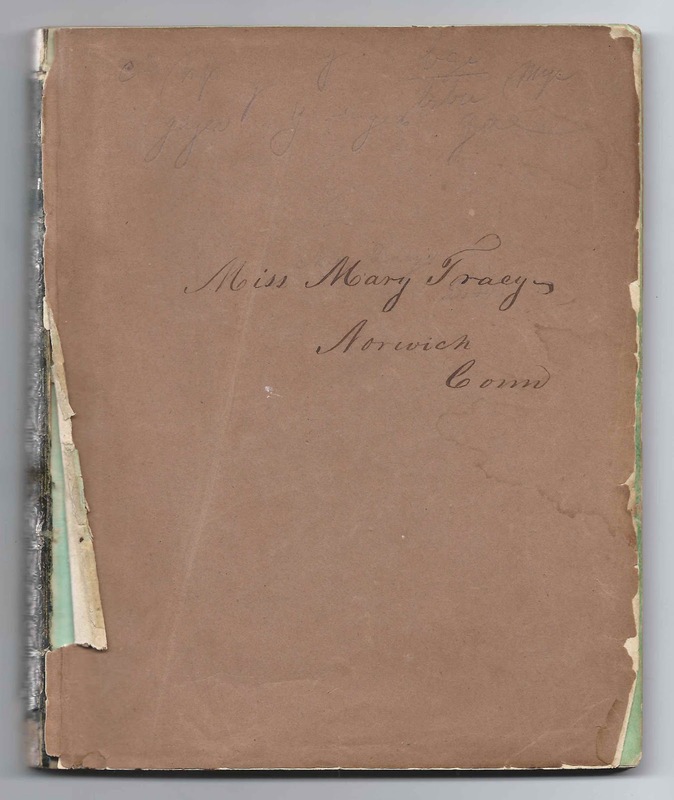 1838-1851 autograph album of Miss Mary Tracy of Norwich, Connecticut. 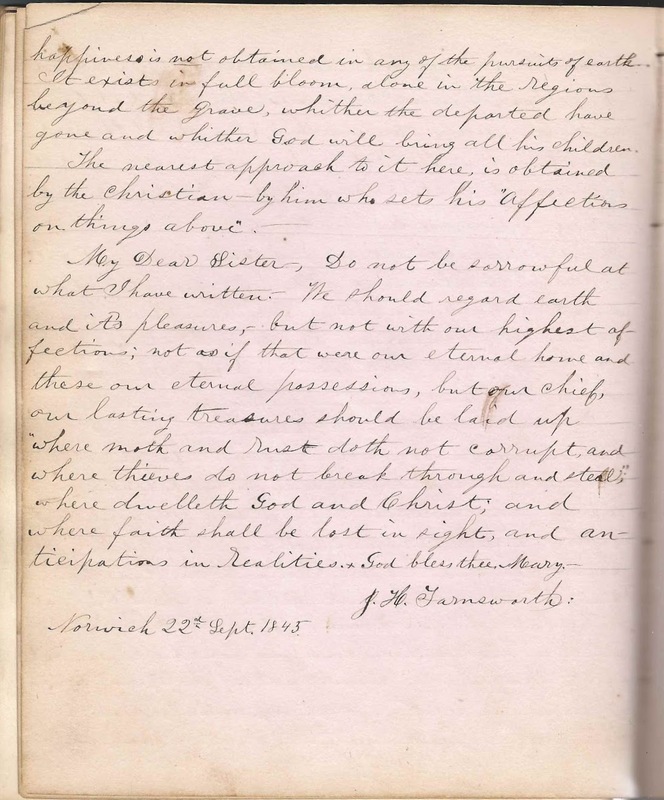 See another post that features the 1846-1851 autograph album of Aseneth (Nichols) Turner of Norwich, Connecticut. I didn't notice the names of any people who had signed pages in both albums. Mary's album is missing its front cover. It measures approximately 7-3/4" x 6" and contains the sentiments of over 30 of Mary's friends, most of whom, unfortunately, signed with given names only or with initials. An alphabetical list of the signers appears at the end of this post. The album was presumably given to Mary at Christmas in 1839 by a person whose surname appears to be Tracy. I can't decipher the first initial, whether a C or a B. The album was printed by J. C. Riker of New York, New York. It has several embossed pages, including two with hand painting, one of which is the title page, below. I found a couple possibilities for a Miss Mary Tracy at Norwich, Connecticut, one born about 1802 and another born 1824. Hopefully a reader will be able to tease out her identity from the various clues in the album. 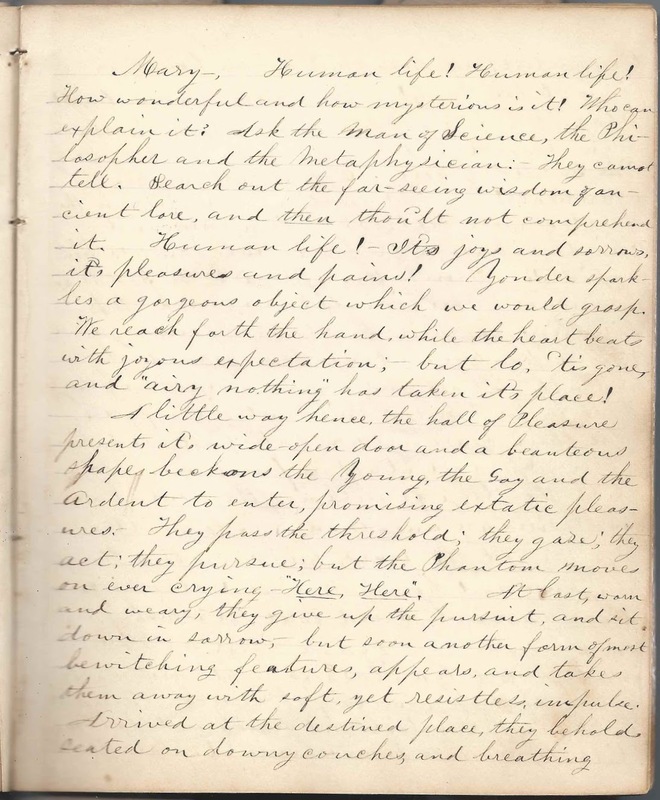 One signer referred to himself as Mary's brother, and the handwriting seems very similar to that on the page signed on Christmas Day 1839 by C. Tracy or B. Tracy. In case it's a clue, he mentions "The Troy Budget". Could be a red herring, but in my research on the Tracy family of Norwich, Connecticut, there was a Troy, New York, connection. One person, J. E. W., or J. E. H., who signed a page on September 22, 1848, called herself or himself Mary's cousin. 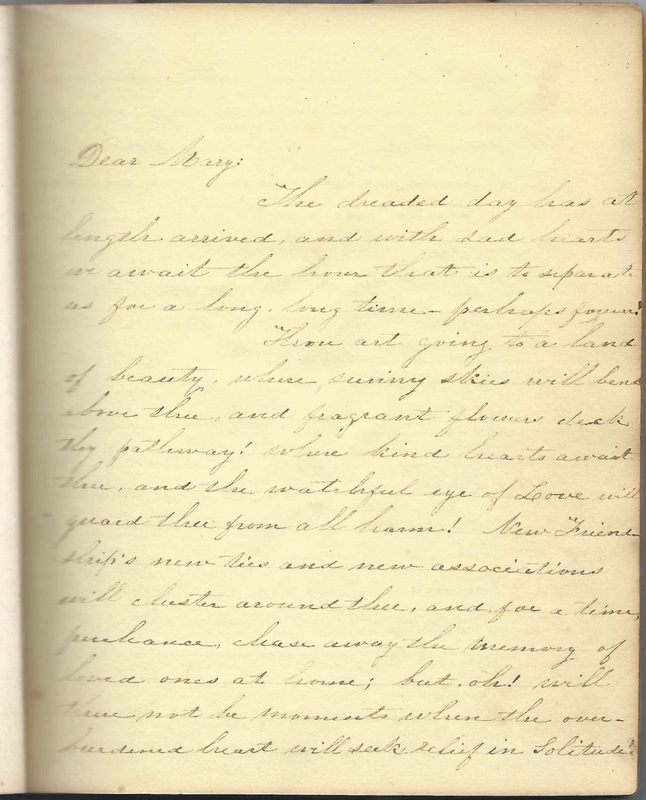 In case this is a clue, Lizzie inscribed a 3-page sentiment at Norwich, Connecticut, on September 1, 1851, and implied that Mary was about to leave her home for a far-off place, though places didn't have to be too far off in 1851 to seem far away. J. H. Farnsworth, who was presumably Rev. Jeremy Hoadley Farnsworth (1822-1899), wrote a candid four page sentiment at Norwich, Connecticut, on 22 September 1845. One signer appears to have signed his name backwards. I believe he was George Palmer, who inscribed a two-page sentiment at Norwich, Connecticut, on December 10, 1848. One person sketched a swimming dog with a stick in its mouth. 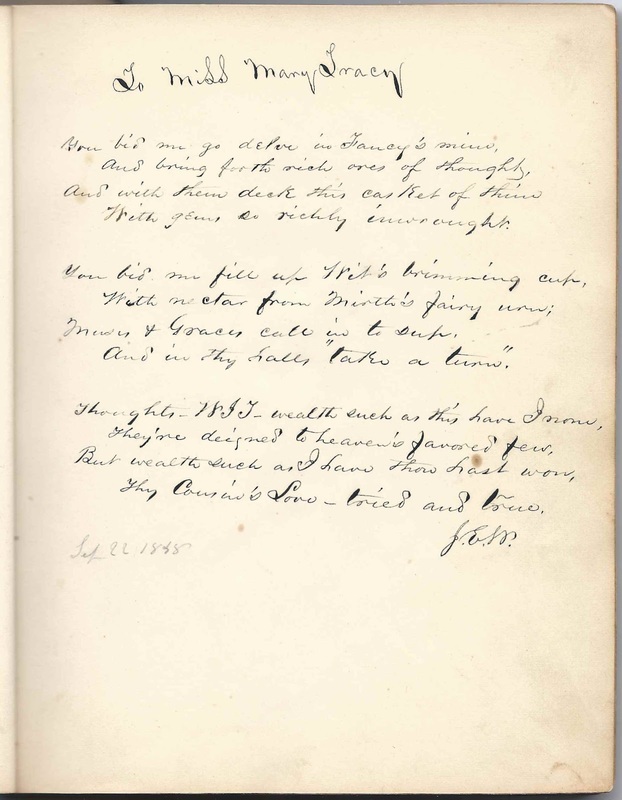 I'm not sure if the signer's name was Cowper or the poem on the page was by the poet William Cowper. I tried searching for the wording online and didn't come up with a Cowper poem, but perhaps it was paraphrased. J. E. W., signed September 22, 1848; Mary's cousin. Not sure of surname initial; could be H. or ? 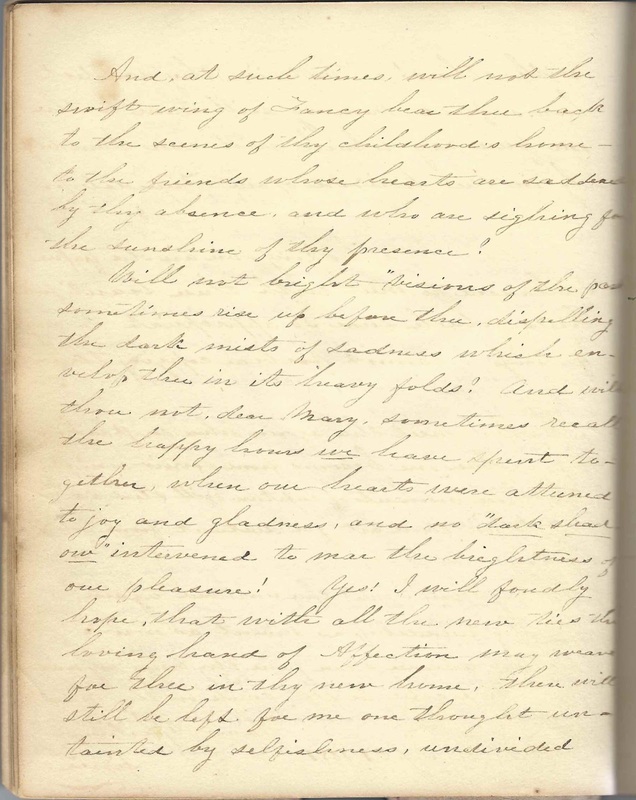 3-page sentiment of Lizzie at Norwich, Connecticut, signed on September 1, 1851. She implies that Mary is leaving home for a far-off place. Not sure of name, but possibly Leumas, signed at Norwich, Connecticut; this person signed another page in the album as well. Facing pages signed by Mary's brother, "From the Troy Budget". I don't know if the signer was Mary's brother, her brother in law, a Quaker brother or ? J. M. L., signed Norwich, Connecticut, in October 1848; not sure of second and third initials. 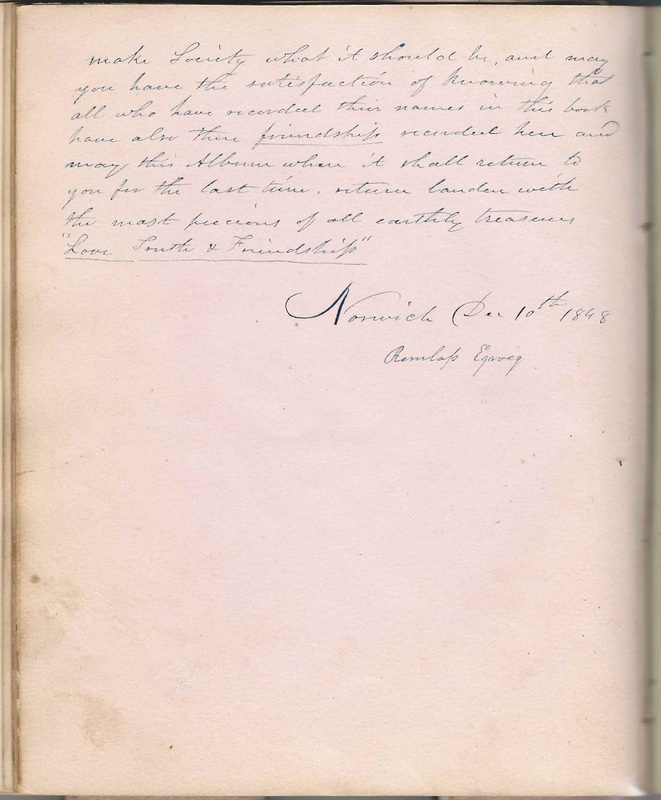 Facing pages signed at Norwich, Connecticut on May 28, 1844, by H. W.
Very faint: Fitz Clarence, signed at Norwich, Connecticut, possibly in 1846. There's what appears to be a surname but I can't make it out. 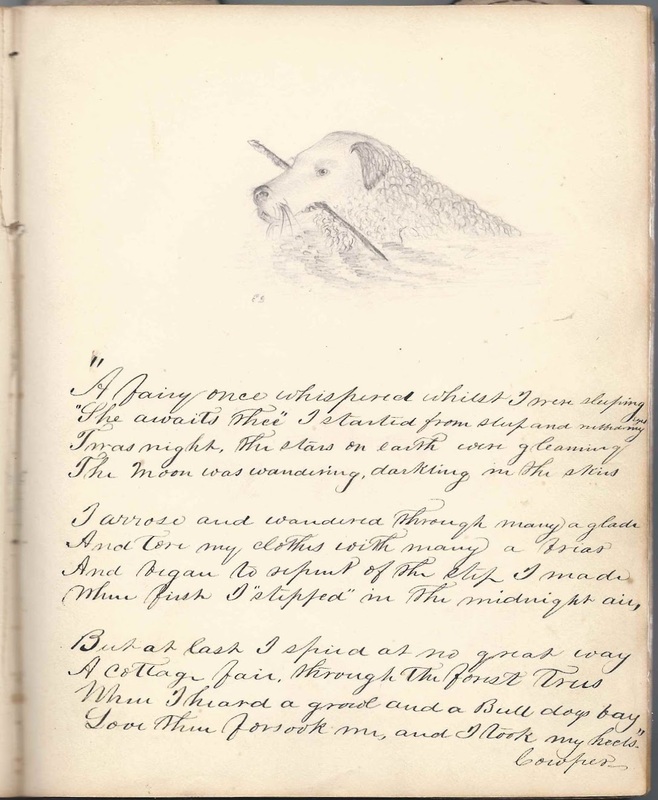 Page with a poem and a sketch of a swimming dog with a stick in its mouth. The poem is signed Cowper, but I couldn't find that poem online. Perhaps Cowper was not the poet William Cowper but was the surname of the person who signed the page and sketched the dog. E. M. P. or E. M. T. or ? 2-page unsigned sentiment that may have been written by Miss Mary Tracy herself, as the handwriting looks similar to hers. F. Dennis, signed at Norwich, Connecticut, on November 6, 1841. Not positive of initial. 4-page sentiment inscribed by J. H. Farnsworth, at Norwich, Connecticut, on 22 September 1845. I believe he was Rev. Jeremy Hoadley Farnsworth (1822-1899). 2-page sentiment signed by someone who wrote his name backwards at Norwich, Connecticut, on December 10, 1848. George Palmer, I believe. Hi, I write in copperplate and study the different styles of this handwriting from the nineteenth century (especially in old albums). The last two signed pages of the 1839-1851 Autograph Album of Miss Mary Tracy of Norwich, Connecticut definitely say LEUMAS. I would suggest that this could be Samuel backwards and may have been done to hide the identity of the writer. The last poem (I am weary..etc) is by Longfellow. Nick, that is terrific! Thank you so much for taking the time to comment. I've run across this before but didn't think of it in this case. And this Mainer missed the Longfellow connection, too. Thankfully you happened by! I'm amending the post with your insight, in case the addition of Samuel to the clues, if a brother or husband, might help future readers recognize this Mary from their family research. Could you contact me privately (email under Inquiries) with your contact info in case you're willing to help with future posers?